Set in Tahoe Vista this holiday home is 38 km from Reno. 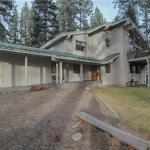 The property features views of the lake and is 35 km from South Lake Tahoe. A dishwasher an oven and a microwave can be found in the kitchen. A flat-screen TV with cable channels and DVD player is offered. Other facilities at Anderson 200 Holiday home include a hot tub and barbecue. Carson City is 26 km from Anderson 200 Holiday home while Stateline is 32 km away. Reno-Tahoe International Airport is 38 km from the property.